California fire officials on Monday announced they're mandating the removal of those latches that hold keep the gas flowing after releasing the pump handle. Setting the gas pump to flow while you wash your windshield or take care of other duties could become a thing of the past come October. California fire officials on Monday announced they're mandating the removal of those latches that keep the gas flowing after releasing the pump handle. Some of the latches have been sticking in the open position, leaving them to overflow and cause serious injuries or pose fire dangers, officials said. The pumps affected are made by Vapor System Technologies and are marked with the label VST. That includes 3,000 gas stations -- about a third of the pumps across California. Gas station operators must have the pump latches removed by the Oct. 15 deadline. Department of Forestry and Fire Protection spokseman Daniel Berlant said the gas pump handles must be removed until a "permanent solution or new nozzle is ready," the Sacramento Bee reports. Gas station operators are also advised to post signs telling people that the clips have been removed from the gas handles and warning them to not wedge anything in the handle to keep the gas flowing. 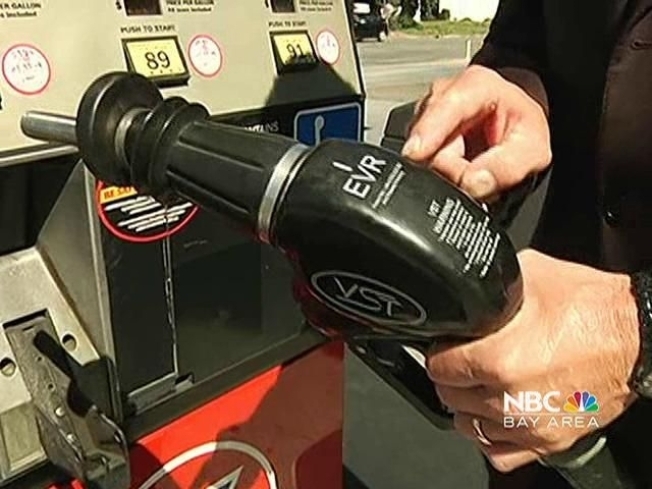 Officials worry that people will try to get around the latchless pumps by sticking gas caps in them or some other device to keep the gas flowing without squeezing the handle. Replacement latches are being made to fix the problem. Letters were sent in May to gas stations throughout the state advising them of the latch problems.